OBJECTIVE The surgical outcome of idiopathic tarsal tunnel syndrome (TTS) is reported to be worse than that attributable to ganglion, tarsal coalition, or tumour, and therefore further development in the surgical treatment for idiopathic TTS is considered to be necessary. Here the efficacy of neurovascular decompression for patients with idiopathic TTS is evaluated. METHODS Twelve feet from nine patients with idiopathic TTS were treated. The patients were aged 52–78 years (mean 64.6 years), and all of them complained of pain or dysaesthesia of the sole of the foot. The posterior tibial nerve was freed from the attached arteriovenous complex (posterior tibial artery and veins). The dissected nerve had a flattened appearance in all of the patients, suggesting nerve compression by the adjacent arteriovenous complex and superficially by the flexor retinaculum. A graft of fat was inserted as both a cushion and an antiadhesive between the vessels and the nerve to achieve neurovascular decompression. RESULTS Patients on whom neurovascular decompression was performed had resolution or lessening of symptoms in their feet. Neither wound infection nor recurrence of symptoms was found during the follow up period (mean 26.8 months). CONCLUSION Neurovascular compression syndrome plays a part in idiopathic TTS, and adding neurovascular decompression to resection of the flexor retinaculum is effective. Our surgical method of adding neurovascular decompression to tarsal tunnel opening was found to be effective for idiopathic tarsal tunnel syndrome although the number of patients in which this treatment has been used is small. Here, we present our method in detail. We surgically treated 12 feet in nine patients (three men and six women) with idiopathic tarsal tunnel syndrome (table). The patients were aged 52–78 years (mean 64.6 years) at the time of treatment, and the affected foot was the right in six, left in six, and bilateral in three. All of the patients complained subjectively of pain or numbness in the sole of the foot and showed objective hypaesthesia. Sensory disturbance of the sole excluding the heel (heel sparing), which suggested a lack of involvement of the calcaneal branch of the posterior tibial nerve, was found in nine feet. Tinel's sign at the posteroinferior point of the medial malleolus, running to the first toe, was positive in all of the feet. Posterior tibial nerve blocking in the tarsal tunnel using 3 ml 1% lidocaine4 resolved the sole pain or dysaesthesia in all of the patients. Sensory nerve conduction velocity (SCV) measurement was carried out in five feet. Three feet showed no response and the others showed a slow SCV, less than 35 m/s. The disease was diagnosed on the basis of both the positive Tinel's sign and the effectiveness of tarsal tunnel blocking, and considering the SCV findings in a patient complaining of painful dysaesthesia localised at the sole of the foot. Surgical treatment was indicated for patients who wished it, and whose symptoms were severe and not tolerable for daily life and who had shown no response to conservative medication for at least 3 months after establishing the diagnosis. Under local anaesthesia and mild sedation, a 9 cm bow-like skin incision was made 1.5 cm below the medial malleolus. A tourniquet was not used. After full resection of the flexor retinaculum along the skin incision, the posterior tibial artery and veins (arteriovenous complex) were exposed. Under the surgical microscope, the posterior tibial nerve was identified after dissection of the posterior tibial arteriovenous complex (fig 1). The posterior tibial nerve, which is attached to the arteriovenous complex, was freed from the dissected posterior tibial artery and veins, after confirming that no nerve compressing structures such as a ganglion or an osseous prominence, had developed around the nerve. Diagram of operative procedure for left tarsal tunnel syndrome. During dissection of the nerve and vessels, the perineurium was preserved intact. The dissected nerve had a flattened appearance in all of our patients, suggesting the occurrence of nerve compression by the attached arteriovenous complex and by the flexor retinaculum superficially. 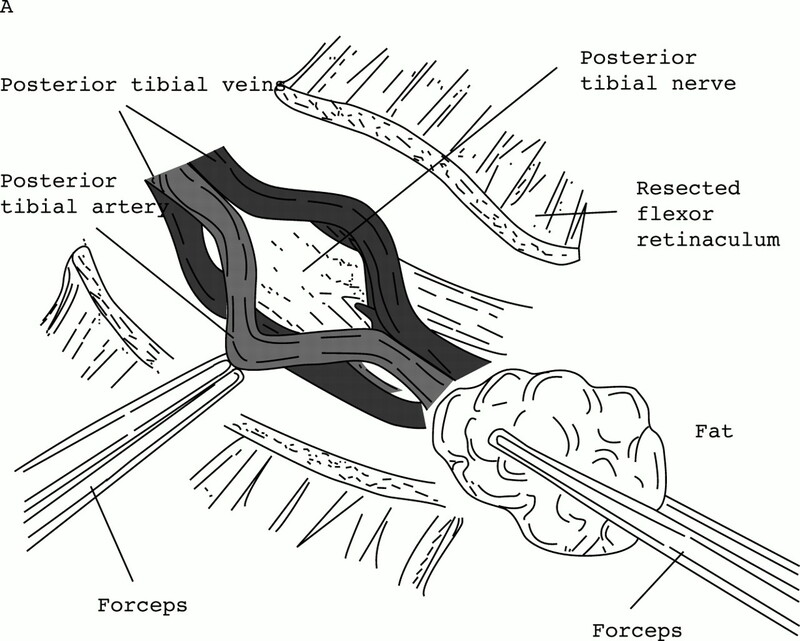 A subcutaneous graft of fat was inserted between the freed vessels and nerve to allow neurovascular decompression (fig 2). A subcutaneous drain was then placed, and subcutaneous and skin closures were performed by layer leaving the resected retinaculum open. Intraoperative scheme and photographs of the left foot of patient 4. The posterior tibial nerve can be identified through the divided posterior tibial artery and veins. Note the grafted fat held by forceps (A, B). Fat was placed between the posterior tibial nerve and vessels (C). Postoperative results were evaluated based on the resolution of subjective complaints and improvement of objective neurological symptoms. Postoperative resolution of painful dyaesthesia and sensory disturbance was estimated as excellent, marked improvement of both as good, slight improvement of both as fair, and no postoperative improvement as unchanged (table). The postoperative follow up period was 9–61 months (mean 26.8 months). Patient 1, who underwent single tarsal tunnel opening, showed no improvement of painful dysaesthesia in the sole (foot 1). The idea of reoperation was rejected. In subsequent patients, neurovascular decompression was performed in addition to tarsal tunnel opening. Burning pain and hypaesthesia of the sole were resolved in patient 2 (feet 2 and 3) and patient 7 (feet 9 and 10); numbness and hypaesthesia of the foot sole were also resolved in patient 3 (foot 4) and were markedly improved in patients 8 (foot 11) and 9 (foot 12). In patient 4, dysaesthesia and hypaesthesia of the sole were markedly improved in the right foot (foot 5), and sole dysaesthesia was resolved and the movement of the first toe was improved in the left foot (foot 6). In patient 5 (foot 7), slight dysaesthesia remained postoperatively, although foot sole pain was resolved. In patient 6 (foot 8), burning foot sole pain and hypaesthesia improved partially. Neither wound infection nor symptom recurrence was found in these patients. Long term follow up CT and MRI showed that the remaining vascular and nervous groups had separated (fig 3). Follow up CT in patient 3. Note separated branches of the right posterior tibial nerve (arrowheads) and vessels (thin arrow) 18 months after surgery, by contrast with the neurovascular complex (thick arrow) in the left tarsal tunnel. The aetiology of tarsal tunnel syndrome has been attributed to the existence of a ganglion, an osseous prominence with tarsal bone coalition, trauma, varicose vein, hypertrophy of the flexor retinaculum, neurinoma, tenosynovitis, an accessory or hypertrophic abductor hallucis muscle, or is sometimes idiopathic.1 2 6 8-11 The distribution of the causes has varied among reported series. Satoh et al 1 reported that the causes were idiopathic in 29 (56%) of the 52 feet they investigated, a ganglion in 19%, trauma in 14%, tarsal coalition in 8%, and varicose vein in 4%. Takakuraet al 8 stated that a ganglion was the most frequent cause (36%), followed by tarsal coalition (30%), idiopathic (18%), and trauma (10%) in their study of 50 feet. Lam3 found no compressing mass (idiopathic) in nine out of 13 (69%) patients. By contrast, Ricciardi-Polliniet al 7 found some causes in all of the eight feet they studied. Radin6 reviewed previously reported cases in 1983, and noted that 33 out of 74 feet (45%) were affected by idiopathic tarsal tunnel syndrome. Linscheidet al 4 reported a series in which idiopathic tarsal tunnel syndrome represented only three of 24 feet (13%). However, they found an enlarged posterior tibial vein in 13 feet (54%), which was tortuous in at least six feet and varicose in three. The tortuosity they reported may be considered a normal variation, as we saw tortuous posterior tibial veins in all of our patients. Idiopathic tarsal tunnel syndrome includes the condition in which no evident nerve compressing lesion is recognised. However, neurovascular compression may exist, as the nerve and arteriovenous complex run together in the tarsal tunnel, a different condition from that in the carpal and cubital tunnels. In fact, the flexor retinaculum is usually much thinner in tarsal tunnel syndrome than in carpal tunnel syndrome, and resection of the tarsal flexor retinaculum is much easier than the tough carpal one, suggesting that nerve compression is not attributable to the tarsal flexor retinaculum alone. 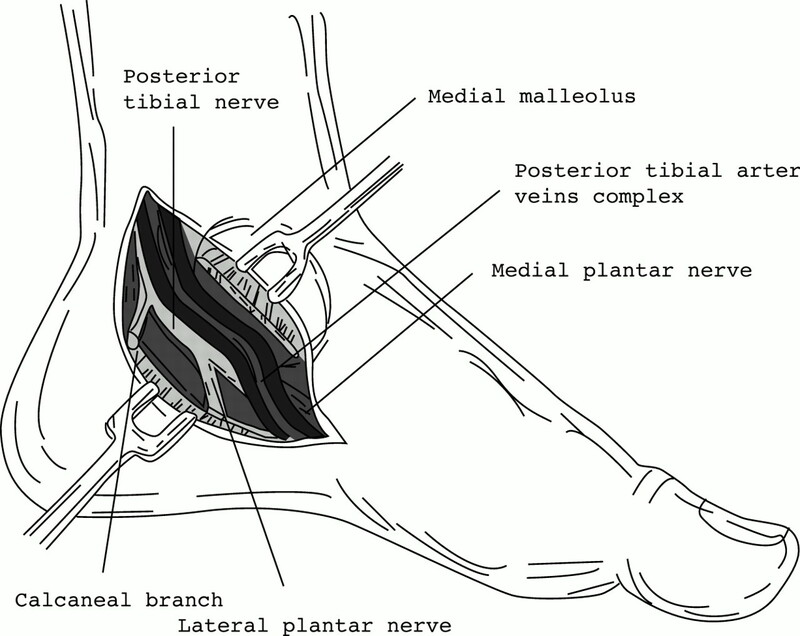 The posterior tibial nerve and arteriovenous complex are combined tightly together in the tarsal tunnel. Therefore, we think that it is possible for the nerve to become compressed by these vessels. In fact, after dissection of the nerve and the vessels, the nerve did have a flattened appearance in all of our patients. Linscheid et al and Lam suspected a mechanism of nerve compression by the engorged vein,3 4suggesting the neurovascular compression that we think occurs. Electrophysiological studies including the terminal latency of the motor nerve, SCV, and EMG have been reported to be useful for diagnosing tarsal tunnel syndrome.1 2 4 5 11 12 16 17 However, these examinations tend to yield positive results less often in this disease than in other forms of peripheral entrapment neuropathy producing motor nerve symptoms such as carpal or cubital tunnel syndrome.1 2 4 8 11 By contrast, Tinel's sign is usually positive, and is thought to be the most reliable criterion for diagnosis.1 4-6 8 We consider that tarsal tunnel blocking4 in the presence of positive Tinel's sign is diagnostically useful with electrophysiological examinations as supportive evidence. In a patient with a ganglion or a tumour, surgical removal is usually performed.10 11 18 Surgical resection is usually performed for a varix,10 15 and bony resection for an osseous prominence with tarsal bone coalition.15 For idiopathic tarsal tunnel syndrome, several surgical methods have been used, including single resection of the flexor retinaculum (tarsal tunnel opening),9 10 18 nerve dissection of the posterior tibial nerve,5 11 and resection of the veins or arterial branches.4 13 In our method, neurovascular decompression is performed by inserting a graft of fat between the nerve and the vessels to act as a cushion and prevent them from adhering to each other. The use of a tourniquet4 10 11 is considered to be effective for the control of intraoperative bleeding. However, this method is not advisable as it would then be impossible to estimate the degree of neurovascular compression because of the unusual arteriovenous conditions produced by the tourniquet. Although general anaesthesia during surgical treatment of tarsal tunnel syndrome is recommended in the literature,10 we consider that a the combination of local anaesthesia and mild sedation is appropriate. In fact, even in a patient with tarsal bone coalition, who was not included in this series, resection of an osseous prominence using a rongeur under local anaesthesia was not uncomfortable for the patient. Furthermore, local anaesthesia has an advantage in that the patient is able to warn the surgeon of radiating pain, which may save a nerve branch difficult to identify from injury. However, this advantage is reduced when using a tourniquet because of the ischaemia that occurs subsequently in the nerves of the lower foot. The surgical outcome is generally good.2 3 5-7However, patients in whom only a partial improvement or no improvement at all have also been reported2 4 6-8 10 12 In the series reported by Linscheid et al,4 the surgical outcome was less than ideal, and we speculate that the resection of the veins or arterial branches performed as part of their surgical method influenced the vascular circulation of the nerve and was therefore undesirable. Takakuraet al found that the surgical outcome of idiopathic as well as traumatic tarsal tunnel syndrome was worse than that attributable to tarsal coalition, tumour, or ganglion.8 Thus, further improvement of the surgical treatment for idiopathic tarsal tunnel syndrome is considered necessary. If during surgery, a ganglion or osseous prominence is not recognised, and no nerve contacting structures except for the arteriovenous complex are evident, then neurovascular compression should be suspected and decompression with a graft of fat should be added to the tarsal tunnel opening. (1986) Clinical study on tarsal tunnel syndrome. Seikei-Geka 37:271–279, . (In Japanese.). (1969) The tarsal tunnel syndrome: diagnosis and treatment. JAMA 207:716–720. (1967) Tarsal-tunnel syndrome. J Bone Joint Surg B 49:87–92. (1970) Tarsal tunnel syndrome. South Med J 63:1313–1323. (1974) Tarsal tunnel syndrome. Orthop Clin North Am 5:109–115. (1983) Tarsal tunnel syndrome. Clin Orthop 181:167–170. (1985) The tarsal tunnel syndrome. a report of eight cases. Foot Ankle 6:146–149. (1991) Tarsal tunnel syndrome. J Bone Joint Surg B 73:125–128. (1972) Tarsal-tunnel syndrome. Clin Orthop 88:76–79. (1992) Tarsal tunnel syndrome. Report of a case and review of clinical and surgical aspects. Ital J Neurol Sci 13:47–51. (1979) Tarsal tunnel syndrome. Orthopaedic Reviews 8:111–117. (1981) Tarsal tunnel syndrome: an electrodiagnosis and surgical correlation. J Bone Joint Surg A 63:96–99. (1962) The tarsal-tunnel syndrome. J Bone Joint Surg A 44:180–182. (1962) A tarsal-tunnel syndrome. Lancet ii:1354–1355. (1992) Treatment of tarsal tunnel syndrome. Rinsho-Seikei-Geka 27:609–612, . (In Japanese.). (1965) The tarsal-tunnel syndrome. Objective diagnostic criteria. N Engl J Med 273:742–745. (1991) Electrophysiological improvement following decompression surgery in tarsal tunnel syndrome. Muscle Nerve 14:407–410. (1968) Neurological syndromes of the tarsal tunnels. Bulletins of the Los Angeles Neurological Society 33:90–100.